8. Immunology of insect vectors: Midgut Interactions of Sandflies and Tsetse with Kinetoplastid Parasites as a paradigm for establishing infection. 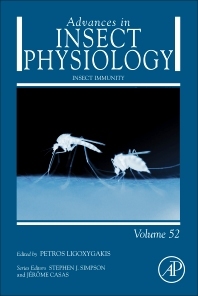 Insect Immunity, Volume 52 provides readers with the latest interdisciplinary reviews on the topic. It is an essential reference source for invertebrate physiologists, neurobiologists, entomologists, zoologists and insect chemists, providing invaluable chapters on Insect Antimicrobial Defenses: A Brief History, Recent Findings, Biases, and a Way Forward in Evolutionary Studies, Phagocytosis in Insect Immunity, The Melanization Response in Insect Immunity, Microbiota, Gut Physiology, and Insect Immunity, Intestinal Stem Cells: A Decade of Intensive Research in Drosophila and the Road Ahead, and Insect Symbiosis and Immunity: The Bean Bug–Burkholderia Interaction as a Case Study, along with other related topics.